“Aren’t you worn out by now?” she asked, tracing a finger along his jaw. She smoothed the plush lapels of his cashmere overcoat, not because they needed attention, but because it gave her an excuse to touch him. “In flagrante delicto? Thanks for spoiling a perfectly good fantasy.” He attempted a scowl, but nothing seemed able to quench the smile in his eyes. The elevator stopped, and she wriggled out of his arms just as the doors opened. A tall woman with elegantly coiffed silver hair stepped aboard, and the elevator resumed its descent. William pinched Elizabeth on the rear, wringing a startled squeak from her. She wrestled his hand back down to his side, responding to the woman’s curious glance with a sheepish smile. William’s expression would have looked at home on a choirboy—that is, one who had just launched a spitball from the church balcony. Their shared whimsical mood surprised Elizabeth after yesterday’s disaster. Perhaps they were overcompensating as a form of denial, just as they seemed determined to avoid mentioning Rose or Catherine. But whatever the reason for their high spirits, she wished going back upstairs was a genuine option. A long, lazy day in bed, supplemented by plenty of goodies from room service, sounded much better than braving the Black Friday crowds and the frigid November gloom. They stepped off the elevator into the lobby of the Four Seasons. Warm, neutral colors dominated the space, from the beige limestone pillars lining the walkways to the blond wood trim and the light panels radiating from the ceiling. The woman from the elevator approached the hotel reception desk, the click of her heels fading to a hollow echo. William kissed her cheek. Elizabeth and Georgiana exchanged greetings, though Georgiana didn’t return Elizabeth’s smile. Georgiana shrugged again and stared back at William, hands on her hips. But her bravado faltered under his intense scrutiny, and her gaze dropped to the floor. “Didn’t Courtney’s family have something planned for Thanksgiving?” Elizabeth asked. “It’s a shame they don’t get along.” Elizabeth said mildly. She could feel herself wanting to try too hard with Georgiana. Relax. She’ll like you once she knows you better. Maybe. “Yeah, Barneys first. I like the pizza at Fred’s.” It was a trendy eatery located inside Barneys, Manhattan’s most exclusive department store. “Great idea.” Elizabeth had set foot in Barneys only once in her life, for a goggle-eyed stroll through the first floor during Jane’s visit to New York last year, but Georgiana didn’t need to know that. “Gran’s been outside all this time? Why didn’t you say something sooner?” William’s scowl deepened. “You and Georgie might as well stay here where it’s warm,” Elizabeth said, giving William a wan smile. “I’ll go talk to her.” She chafed at this imperial summons, but resolved to be on her best behavior. “Whatever.” She whipped her phone out of her purse. A blast of frigid air enveloped Elizabeth as she and William passed through the hotel doors. She shivered and pulled her coat tightly around her. The temperature must have plummeted overnight. Either that, or Rose’s presence had added an extra chill to the air. “Very well.” The window rolled back up into place. Allen emerged from the car and helped Elizabeth into the back seat. He remained outside the car, standing at attention with his back to the driver’s door. “Maybe everyone else knew it was best to ignore Catherine and hope she’d go away.” Elizabeth’s smile was rueful. “Four o’clock, then,” Rose said. “Now, if you’ll excuse me, I must be on my way.” She knocked on the window to signal Allen. Elizabeth said her goodbyes and left the car with Allen’s assistance, but William stayed in his seat. Rose raised her eyebrows in silent inquiry. William jumped from the car before Rose could respond. The sounds of the city seemed to assault him: a pack of noisy tourists chattering on their way down the sidewalk, the shrill whistle of the doorman as he summoned a taxi, the squealing of tires followed by the angry shout of a horn on Madison Avenue. “Nothing important.” He shepherded her through the door and headed for Georgiana, who stood frowning at the display on her phone. “Ready to go?” he asked. Elizabeth glanced down at herself and grimaced. The wrinkles in her charcoal gray skirt were visible through the gap in her coat, which she hadn’t bothered to button on exiting the hotel limo. She hadn’t expected to need another dressy outfit so soon. 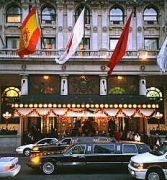 But here she was, mounting the steps in front of the Plaza Hotel on her way to meet Rose Darcy for tea. “I’d tell you not to worry,” she said, “but I think I like having you indebted to me.” She watched him go, and then gathered her courage and turned in the direction of the Palm Court. “How was your luncheon?” Elizabeth asked as she slipped into the chair across from Rose’s. Elizabeth had toured the Plaza with out-of-town guests on several occasions, but this was her first experience with its lavish tea service. Today, a distinct flavor of the holidays filled the room. 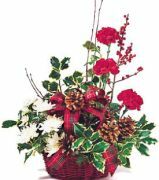 Everywhere she looked, she saw fresh flowers in deep red and creamy white, garnished with deep green sprigs of holly. In one corner, a harpist plucked a mellifluous version of “Angels We Have Heard on High.” Even the petit fours reinforced the Christmas spirit, with tiny frosting poinsettias and silver bells piped on top. “It sounds beautiful.” Elizabeth hadn’t expected to find Rose chatting amiably. No doubt it was the calm before the storm. Margaret smiled and hurried away. “That’s right. She found a dress at Barneys for New Year’s Eve.” Elizabeth thought it best not to mention her own new dress, purchased by William as an early Christmas gift. “She and William didn’t see eye to eye on that subject, but they finally compromised. I think you’ll like what she bought.” Elizabeth didn’t add that she had been the one to locate the dress that satisfied them both. “If I do, William will indeed have worked a miracle.” Rose took a delicate sip of her tea. Elizabeth winced at Rose’s cool tone. She hadn’t intended to sound presumptuous. She folded her hands in her lap, fidgeting with a loose thread on her damask napkin. “He did?” Elizabeth had difficulty imagining William opening his heart to his grandmother about something so painful. “Really, Mrs. Darcy, it’s not necessary,” Elizabeth said, out of politeness rather than sincerity. She poured herself a cup of tea. Elizabeth concealed a smile behind the teacup she raised to her lips. Rose’s procrastination probably had more to do with pride. To apologize in the car would have been a humbling experience following William’s demand for an apology. “And as for Lewis de Bourgh—” Rose paused, frowning. “With a mother like that, it’s no wonder,” Elizabeth muttered before she could stop herself. Elizabeth bristled at the suggestion. William had merely buried the worst of his pain where no one—not even his family—could see it. Rose offered the tray to Elizabeth. The cucumber sandwiches looked tasty, but after Margaret’s comments it seemed safer to leave them for Rose. Elizabeth chose a petit four decorated with a tiny Christmas tree, a mini-eclair, and a triangle of toast topped with thin shavings of smoked salmon. While Rose selected her own morsels, Elizabeth decided to take control of the conversation. Elizabeth opened her mouth to speak, but then she froze. What was she doing? Rose had no business judging her according to her father’s bank balance or her mother’s lack of education. A tart refusal hovered on her lips, but she remembered her goal—to smooth things over for William’s sake. For him, she would swallow her pride, even if it gave her indigestion. “My father is an engineering manager; he’s been with the same company since he graduated from college. I have four sisters; the eldest is a lawyer.” And the youngest is … Lydia. “I did ask him. Bear in mind that I didn’t raise the subject of your background just now. You did.” Rose raised her teacup, her expression impenetrable. Elizabeth hid her smile behind her napkin. Any remaining mystery about the source of William’s pompous tendencies had just been solved. Rose eyed her intently but didn’t comment. “He told you that?” Elizabeth’s mouth hung open for a moment. “Overwrought? Do you mean angry?” It seemed likely, based on what Elizabeth had heard from William. Elizabeth blinked at the sudden change in Rose’s voice. Then she noticed the two well-dressed women passing by, their tight, wide-eyed expressions suggesting recent face lifts. They paused beside the table, the air around them rich with fumes of Chanel No. 5. Rose introduced Elizabeth as “a visitor from San Francisco,” with no mention of her connection to William. The small talk gave Elizabeth time to regroup. Her last few comments had been idiotic. First she had cited the attraction of opposites, and then she had become livid at the suggestion that she and William shared little in common. She needed to stop blurting out every thought manufactured by her whirling brain. “I was.” The sadness in Rose’s eyes caught Elizabeth by surprise. Elizabeth looked into Rose’s eyes, their expression no longer hidden by a dispassionate mask. In a flash of insight she recognized the emotion blazing there. Rose was afraid. Whether she feared an unhappy ending like his parents’ for William, or simply dreaded losing her influence over him, wasn’t clear. Either way, the knowledge softened the biting retort Elizabeth had been about to deliver. “That’s not what I meant,” Elizabeth said, a tremor in her voice. “But I think it helps him to share his feelings, and to know that his heart is safe with me, just as mine is safe with him. You can’t possibly think it’s better for him to brood alone and shove everything down deep, where it eats away at his soul.” Elizabeth flicked a tear from the corner of her eye. At the sound of the voice, both Rose and Elizabeth started slightly. Rose abruptly donned a pleasant, noncommittal mask. The maneuver, which Elizabeth had seen William perform too often to count, was poignant. She wondered if Rose’s heart had ever had its own safe haven in which to rest. Rose nodded, a slow, reluctant gesture. “It does.” Elizabeth had to strain to hear her. Rose didn’t answer, her expression as blank and controlled as ever. “Eleanor, what brings you here? I thought you preferred coffee to tea.” A glint in Rose’s eye suggested an inside joke to which Elizabeth wasn’t privy. “William is here?” Rose glanced at Elizabeth for confirmation. “It was fine, really.” They turned together toward the Oak Bar. “It’s because she has,” Elizabeth retorted with a smile. Elizabeth smiled weakly as they stepped into the Oak Bar. If Eleanor had intended to offer reassurance, her routine needed practice.